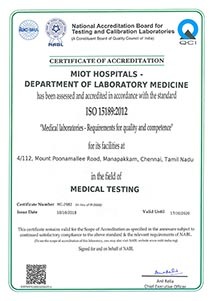 MIOT International is accredited by the National Accreditation Board for Hospitals & Healthcare Providers (NABH), established by the Quality Council of India. The board has established exhaustive healthcare standards for medical institutions in the country with stringent objective elements, all of which MIOT Hospitals is compliant with. 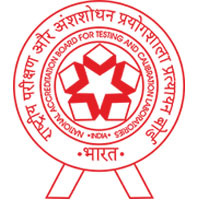 National Accreditation Board for Testing and Calibration Laboratories (NABL) is an autonomous body under the aegis of Department of Science & Technology, Government of India, and is registered under the Societies Act 1860. NABL provides laboratory accreditation services to laboratories that are performing tests / calibrations in accordance with ISO/IEC 17025:2005 and ISO 15189:2012 for medical laboratories. NABL accreditation system complies with ISO/IEC 17011:2004 and Asia Pacific Laboratory Accreditation Cooperation (APLAC) MR001. Based on evaluation of NABL operations by APLAC in 2000, NABL has been granted signatory member status by APLAC and International Laboratory Accreditation Cooperation (ILAC) under their Mutual Recognition arrangements (MRAs). 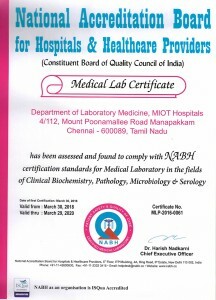 Department of laboratory Medicine, MIOT hospitals has been assessed and found to comply with NABH certification standards for medical laboratory in the fields of Clinical Biochemistry, Pathology, Microbiology & Serology. The clinical and laboratory Standards Institute (CLSI) is a not-for-profit membership organization that brings together the varied expertise of the worldwide laboratory community for the advancement of a common cause: developing and implementing clinical laboratory standards and guidelines that help laboratories fulfill their responsibilities with efficiency, effectiveness and global applicability. MIOT International has been independently assessed and accredited by the Indian Health Organization for its compliance with the principles and practice of clinical governance as defined and laid down by the Indian Health Organization. 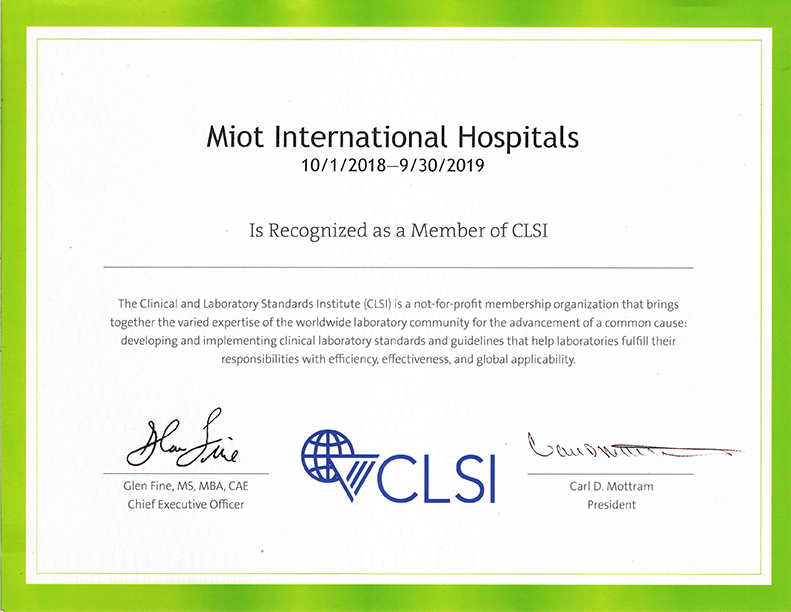 MIOT Laboratory Services was awarded this certification in recognition of standards that reflect internationally-accepted processes and procedures for clinical laboratories that consistently produce accurate results. The Essential Standards incorporate a step-wise improvement process and create the foundation for compliance with ISO 15189 – the global standard for quality and competence in medical laboratories.